Enterprises are moving their applications to the cloud for a wide variety of very good reasons: The cloud makes scaling applications easier. The cloud makes launching incremental data centers easier. 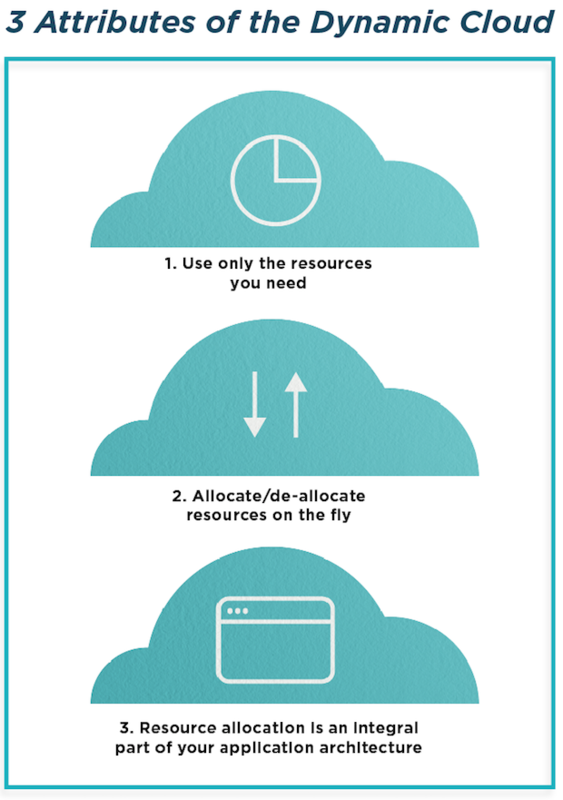 The cloud saves money by allocating the proper resources to specific needs. The cloud encourages innovation by enabling companies to launch new capabilities faster and easier. As organizations get more experience with their cloud investments, however, they’re uncovering the key ingredients for cloud success: a heavy focus on leveraging the dynamic capabilities of the cloud combined with cultural transformation through DevOps. This ebook can help you learn from organizations that have successfully navigated the transition to the dynamic, multi-cloud world. To find out how these benefits are playing out for real enterprises, our survey asked IT professionals to share how they are using the cloud today, how they are adapting their cultures to a cloud mentality, the cloud computing benefits they’re getting, and how they are monitoring their increasingly complex (and increasingly ephemeral) applications. What we learned is that to take advantage of many of the most important benefits of cloud computing, you need to do more than simply move all or part of your application to cloud-based servers in a simple migration. And while maintaining some of your applications in the cloud and some of them in your own data centers (an approach often called the “hybrid cloud”) can be an effective part of a migration strategy, it is not a long-term solution to maximize the benefits of the cloud. The survey revealed that to take full advantage of cloud computing’s advantages, you must update your applications to use the dynamic capabilities of the cloud. Only then, survey respondents said, can you fully realize the scaling, resource allocation, and cost saving properties of the cloud. Additionally, to truly exploit the dynamic cloud—leveraging containers and serverless architectures, or simply scalable EC2 clusters in environments where resources are much more nimble and ephemeral, allocated only when you need them—enterprises must evolve their company culture to thrive in a highly dynamic and constantly moving environment. The best and most common way to do this—according to the survey—is to fully adopt DevOps methodologies. Embracing DevOps and the dynamic cloud in the context of a true organizational transformation may seem like a daunting challenge, but organizations all over the world are finding that adopting these dynamic methodologies significantly boosts their growth and innovation. Notably, the survey results suggest DevOps success requires a significant commitment—partial DevOps adoption might be not just ineffective, but actually counterproductive. Phase 1. Traditional data center use: This category comprises organizations with a majority of their strategic applications still running in a private data center. Many of these organizations may still be using the cloud only for development or other less strategic workloads. Phase 2. Static cloud use: These organizations are in an initial lift-and-shift stage of cloud migration, essentially using the cloud as an additional data center to help reduce costs and sharpen the focus on their core business. Using the cloud in this fashion can speed their provisioning process and make it easier to add new capacity. Phase 3. Dynamic cloud use: Companies in this group are exploiting the cloud in a dynamic way, automatically allocating and de-allocating resources on the fly for maximum agility to deal with spikes in demand and accelerate time to market. Examples of dynamic cloud use include automatic scaling, dynamic routing, automatic allocation of cloud resources, Function-as-a-Service (FaaS), and other “serverless” technologies. So as organizations move to the cloud, some are using the cloud as simply a better data center, while others are using the cloud as part of a bigger transformation toward agility and speed. As such, dynamic cloud users do not view their investments in the cloud as standalone technologies, but as yet another tool in their kit. Many of these organizations are combining their cloud investments with other emerging technologies that facilitate more dynamic allocation of resources. 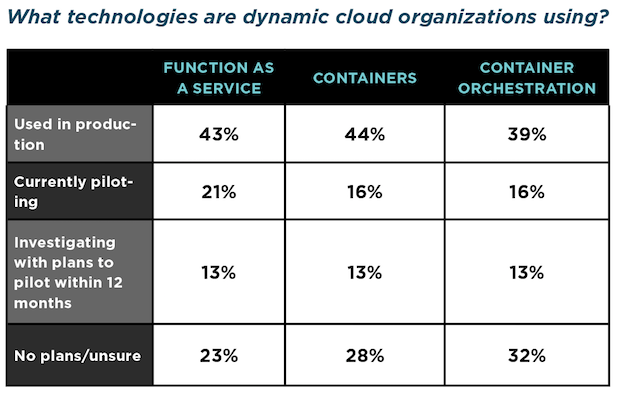 In fact, compared with static cloud users, dynamic cloud users were 23% more likely to use serverless technologies like FaaS (such as AWS Lambda), 26% more likely to use containers (e.g., Docker), and 39% more likely to use container orchestration (e.g., Kubernetes). Clearly, the technology adoption patterns of dynamic cloud users show the importance of automation to deliver the speed and agility promised by the cloud. Automation enables faster processes and also promotes more stable, more consistent processes. Importantly, dynamic cloud users are not approaching automation relying on individual tools; they are exploring a portfolio of DevOps and continuous integration/continuous deployment (CI/CD) tools that enables a holistic process. Even more significant, perhaps, is the increased organizational agility implied by these adoption patterns. Dynamic cloud organizations are showing a superior capability to tame the steep learning curve required to quickly and successfully adopt emerging technologies like FaaS, containers, and orchestration at scale. In the larger sense, they’re learning to introduce automation within a more comprehensive organizational transformation geared towards embracing new ways of working. While many observers see hybrid cloud solutions—running workloads in both on-premise data centers and in the cloud—as a natural end state for enterprises, the survey results suggest that the hybrid cloud may be more of a transitional strategy. The world is shifting aggressively toward a dynamic, multi-cloud reality as organizations make plans to move their strategic applications to multiple public cloud providers over the next few years. One telling statistic from the survey is the robust percentage of companies already running strategic workloads in the cloud. While relatively few respondents report that the majority of their strategic workloads are currently running completely in the public cloud, most believe they will soon reach that milestone. Not surprisingly, dynamic cloud users move far more of their strategic workloads to the cloud than do static cloud users. Some 82% of dynamic cloud users have an equal mix of strategic workloads running in the public cloud and in private data centers, versus just 19% of static cloud users and 14% of traditional data center users. Interestingly, about half (51%) of static cloud users still run most of their strategic production workloads in a private data center. The numbers imply that dynamic cloud users see greater benefit in moving more workloads to the cloud faster. For instance, while dynamic cloud users often split workloads between the public cloud and private data centers, most (59%) plan to shift the majority of their strategic workloads to the public cloud. 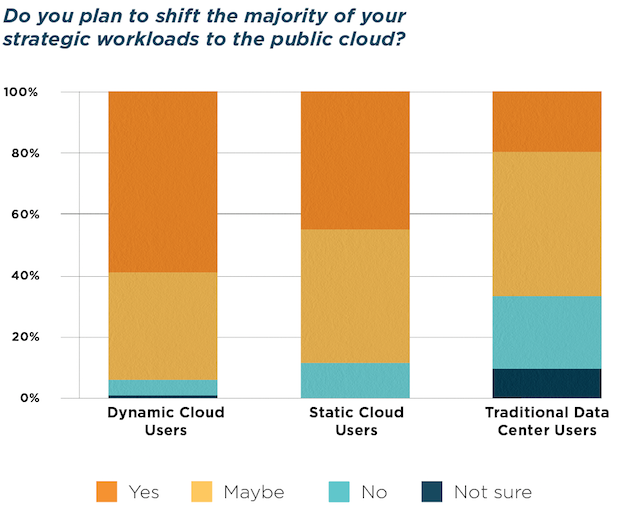 And even while static cloud users and traditionalists do not deploy most of their production workloads to public clouds, 45% of static cloud users and 21% of traditionalists say they plan to move most of their strategic workloads to the public cloud. The move to cloud computing has been making headlines for years. But the lift-and-shift approach that many organizations have undertaken is only a starting point. That’s because of the demonstrable competitive value gained in dynamic cloud environments. The survey found that respondents who had embraced the dynamic cloud had consistently enjoyed significant improvements across a number of tangible metrics, from application uptime to client satisfaction. Dynamic cloud environments offer critical capabilities to enable these outcomes. The dynamic allocation of resources yields easier scaling to handle spikes in load. Easier and faster access to cloud services speeds development. Overall, dynamic cloud organizations say they are able to operate faster and use resources more efficiently. While an improvement of availability from dynamic capabilities from three 9s to four 9s might seem negligible, such improvements can yield tremendous additional business value. The ability to handle load during unique digital moments of truth—whether that’s Black Friday for an e-commerce company, election day for a media company, or the biggest day of the year for your business—can make a big difference in your ability to capture and retain customers. On a more fundamental level, our dynamic cloud survey respondents share a powerful optimism generated by working on the most exciting and promising new technologies. As you ponder your long-term cloud strategy, consider this: Do you and your team really want to be turning servers on and off in five years? Operating in dynamic cloud environments can offer material advantages when it comes to attracting and retaining talented employees who recognize the future of the industry and the skills it will demand and reward. It’s clear that moving to the cloud will remain an imperative for years to come, and the competitive disadvantages of not exploiting the dynamic capabilities of the cloud will eventually catch up to you. Our survey findings show that the dynamic cloud provides the foundation for better, more efficient application performance. Simply put, organizations will be forced to move to the dynamic cloud or face disruption by faster, more agile competitor who already have made the move. Even as they move to dynamic cloud environments, most companies are not putting all their application eggs in one cloud-vendor’s basket. As multiple workloads move to the cloud, each one may find a different cloud provider optimal for its needs. Corporate acquisitions, differing application requirements, and differing cloud capabilities increase the usage of multiple cloud providers. Both current adoption rates and future plans show a clear preference for using multiple cloud providers. Remarkably, while 30% of survey respondents currently use a single public cloud vendor and a further 30% rely on two vendors, just over half (51%) expect to be using two or three cloud computing vendors in the next three years. While the dynamic cloud has been shown to provide an important foundation for success, adopting technology without a robust set of supporting processes is a recipe for failure. The cloud and DevOps are a natural fit—and the survey confirms that dynamic cloud and DevOps create even more synergy. 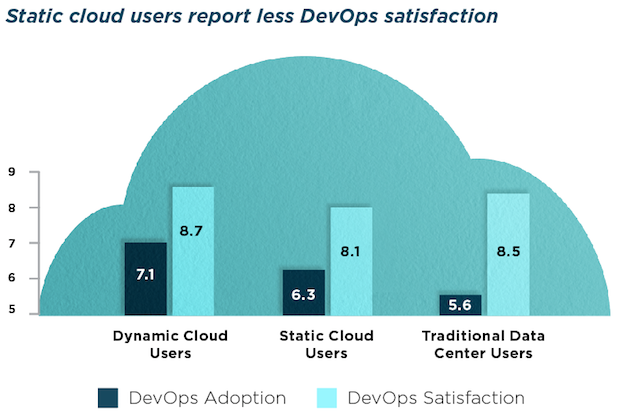 As shown in the chart below, the results are clear: dynamic cloud users report a greater degree of DevOps adoption within their organizations than do either static cloud or traditional data center users. Notably, this group is also the most satisfied with their use of DevOps. DevOps—which involves a cultural shift designed to drive empathy and integration between development and operations teams—can make a big contribution to success in the dynamic cloud. And because DevOps is inherently dynamic in nature, using the dynamic cloud delivers natural synergies to DevOps practitioners. On the flip side, it seems the overlap between cloud computing and DevOps becomes even stronger when organizations adopt a dynamic cloud environment. DevOps helps organizations transform in ways that enable full realization of the dynamic cloud’s benefits. First, DevOps was found to increase an organization’s agility. The survey found organizations with high levels of DevOps adoption are more than twice as likely to be able to reduce time to market. Almost a third (30%) of respondents with high DevOps adoption were able to shorten their development life cycle, compared to just 14% for the moderate and low adoption groups. 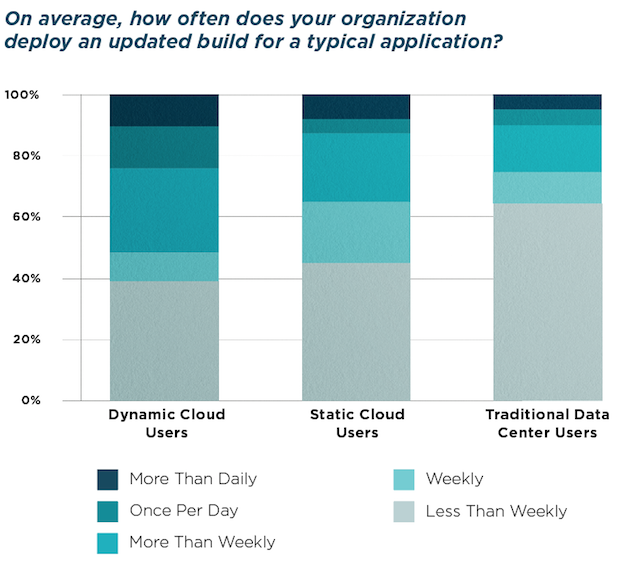 Similarly, as shown in the chart below, dynamic cloud users deploy software more frequently, with almost half (49%) deploying at least several times per week. Among static cloud users, only 41% are deploying with at least that frequency, and only slightly more than a third (35%) of traditional data center users do so. 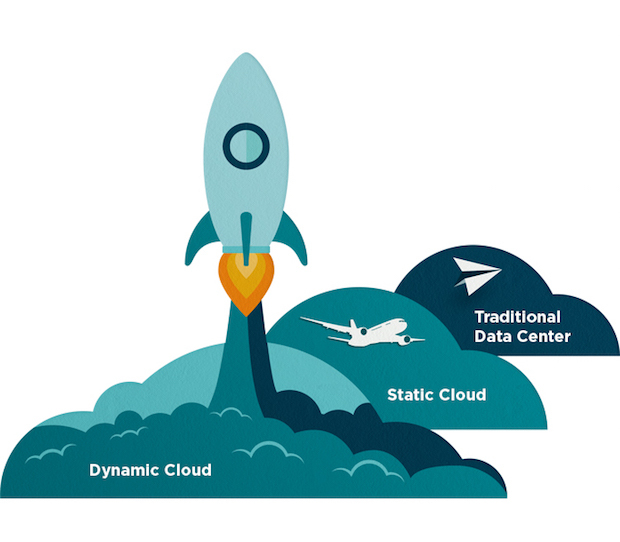 The dynamic cloud is a powerful platform for releasing code changes faster and more frequently. Facilitating the stability of that platform, however, requires operational processes such as DevOps to enable consistency in an environment where resources are no longer managed like pets, each with its own unique maintenance and configuration requirements. In the dynamic cloud at scale, resources must be managed like cattle, where a fleet of basically indistinguishable servers is configured en masse through automation. This approach not only lets you deploy more frequently, it also gives you confidence that if there is an issue, you can resolve the problem quickly. Another way DevOps maximizes the benefits of the dynamic cloud is through improved collaboration and communication. The survey found that organizations with high DevOps adoption reported the greatest improvement in communications across teams. 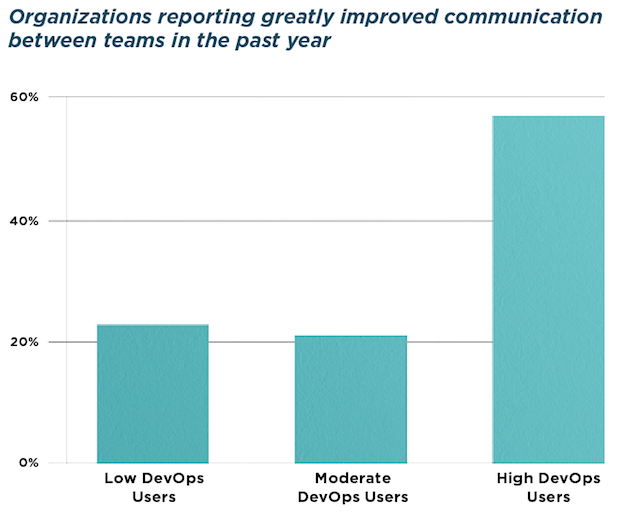 When asked whether communication between teams (e.g., development, testing, release/deployment, management) improved in the past 12 months, an impressive 57% of high DevOps-adoption organizations report greatly improved communications, compared to just 21% of moderate DevOps adopters and 23% of the low DevOps group. Likewise, dynamic cloud users—who are not coincidently the biggest DevOps adopters—also report the biggest improvement in communications between teams, with 34% saying that communication improved greatly, compared to just 20% of static cloud users. DevOps is a key part of obtaining the benefits of the dynamic cloud, and many organizations have begun their DevOps journey in some form. But our survey revealed an important caution—a half-measured DevOps transformation won’t cut it. The survey found the benefits of DevOps were primarily realized by the organizations that were most aggressive in their adoption approach. Even more strikingly, it seems that partial DevOps adoption might be not just ineffective, but actually counterproductive. 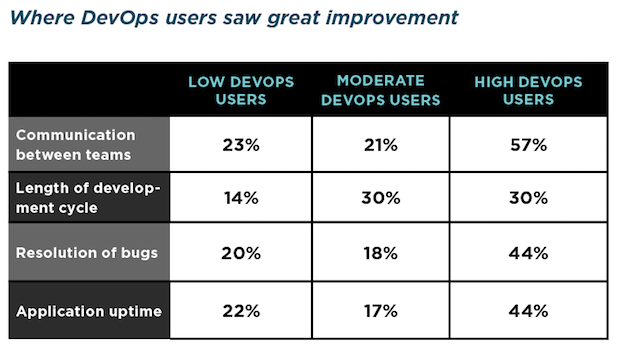 Organizations with high DevOps adoption were much more likely to report significant improvements in key metrics. Conversely, organizations with moderate adoption of DevOps appeared worse off than those that had limited adoption. The level of DevOps adoption was also highly correlated with the organization’s overall satisfaction with DevOps. The message is clear: effective DevOps requires an all-in approach. Our survey shows that DevOps offers significant benefits for organizations that are able to adopt it successfully. The challenge is shaping your transformation so that you’re not stuck in “moderate” DevOps adoption. For example, automation is a core pillar of DevOps, and many organizations look to tooling such as Jenkins and configuration management software to enable automation capabilities. Tooling on itsown, however, will not deliver DevOps maturity. And a reliance on automation in lieu of modernizing organizational and measurement processes can stifle progress. If engineers can’t connect their DevOps efforts to measurable improvements in outcomes that matter for their job and their career, your DevOps initiative may stall, wasting your investment and even leaving you worse off than when you started. While measuring and tracking performance is important in every environment, using multiple clouds and dynamic cloud capabilities such as serverless architectures creates new, even more complex visibility requirements. Maximizing the benefits of the dynamic cloud requires tools that monitor not only the application components, but the entire life cycle of cloud components—even things like containers that may exist only for minutes or seconds. Dynamic cloud users seem to recognize this requirement, and they do more monitoring across the stack than do companies in other segments. For instance, more than two-thirds (70%) of dynamic cloud users—and 62% of static cloud users—are already using or piloting application performance monitoring (APM) tools. 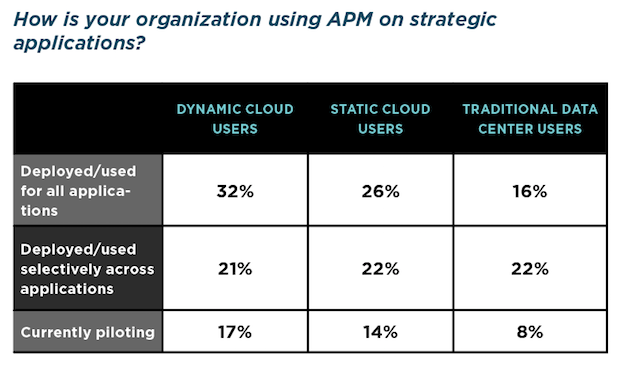 Less than half (46%) of traditional data center users report usage or pilots of APM tools. That meshes well with the idea that successful DevOps initiatives also require robust measurement. 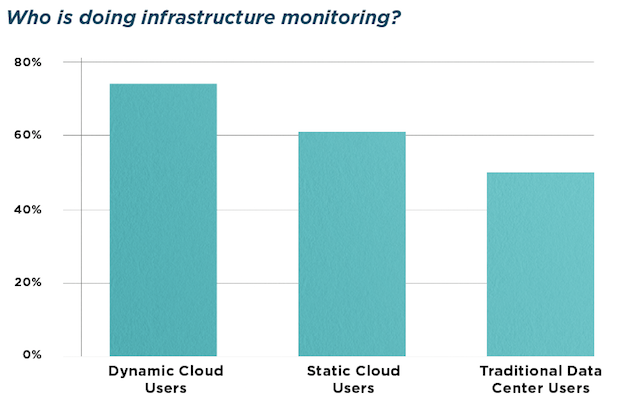 The same holds true for infrastructure monitoring, where 75% of dynamic cloud users and 61% of static cloud users, but only half of traditional data center users, have deployed or are currently piloting infrastructure monitoring solutions. This demonstrates a notable maturity in the tooling used by DevOps and cloud-adopters. These organizations are recognizing the importance of measuring outcomes as part of achieving dynamic cloud and DevOps success. Importantly, these organizations are connecting their efforts to a comprehensive data strategy that lets them understand more than just logged events. Broad and deep performance monitoring helps ensure that these organizations collect metrics that help them gain insight to trends in application performance, such as uptime (availability), app response time, database response time, percentage of transaction time spent in database, resource utilization, and database query times. That’s important, because the complexity of applications in the dynamic cloud can make it harder to pinpoint the source of a performance issue. The full stack monitoring used by dynamic cloud organizations helps trace the interdependencies across multiple application services and distributed systems—not easy to do without appropriate tooling. A comprehensive data strategy for understanding the entire application stack in real time is needed to adopt emerging dynamic technologies while maintaining system stability. Of course, while capturing data and insight from across the application stack is always important, that insight isn’t fully useful unless it’s shared effectively across teams. In keeping with the larger trends revealed by the survey, dynamic cloud organizations consistently reported greater effectiveness in both tracking and sharing metrics across infrastructure performance, application performance, customer experience, and business results. Diverse data sources across the application stack help deepen the understanding of what’s going on and what it means, while a willingness to share those insights works to spread the knowledge and benefit across the team and the organization. It’s yet another important reminder that tooling provides the most value when it’s part of a comprehensive strategy and process. Our survey shows that as organizations quickly shift towards increasingly dynamic, multi-cloud environments, they are leveraging DevOps and advanced monitoring tools to help manage complexity while reaping the benefits of greater agility, lower cost, and faster time to market. Specifically, dynamic cloud use is growing so quickly because it’s helping enterprises scale faster, shorten development cycles, and boost application uptime, among many other benefits. Companies moving to the dynamic cloud get more value out of their migrations. Simple lift-and-shift migrations to the static cloud are a great first step, but organizations need to do more to get the full value of the cloud. Similarly, the survey shows a strong correlation between dynamic cloud success and DevOps adoption. And just as organizations moving to the cloud need to go all the way to the dynamic cloud to reap the full benefits, they also need to go all in on DevOps in order to derive maximum benefits from the combination. Fundamentally, organizations seeking to become more nimble, more efficient, and ultimately more successful must invest in a truly transformational approach to incorporate cloud culture—including DevOps and advanced application and infrastructure performance monitoring and data sharing—deeply into their business. The payoff is the opportunity to gain significant competitive advantage over companies using the cloud as little more than a more efficient data center. On the flip side, organizations that resist the call of the dynamic cloud risk being overtaken by faster, more flexible, more productive competitors. At the end of the day, the survey makes it clear that digital businesses are moving to the dynamic cloud—and DevOps—because it’s better for them. They see greater improvements in key technical and business metrics compared to their competitors who are still living in the static cloud or traditional data centers. That payoff is clearly worth the investment in moving to the dynamic cloud. In February 2017, New Relic commissioned Qualtrics, a global market research firm, to conduct a survey of IT organizations in the United States, UK, Germany, and France to find out how companies are adopting and using cloud computing capabilities. The target audience for the survey was people responsible for delivering customer-facing web or mobile experiences; 61% of respondents were from organizations with 1,000 or more employees and 28% were from organizations with 5,000 or more employees. Respondents also had to be knowledgeable about their organization’s strategic production workloads deployed in private data centers and public clouds. More than 500 people responded. Based on their responses, their organizations were categorized into three segments: dynamic cloud users, static cloud users, and traditional data center users. The research combines both quantitative survey data and qualitative feedback from open-ended survey responses. Migrate faster, resolve issues faster, and ensure the complete success of your cloud adoption initiative.